Drill rocky ground and clay in no time! 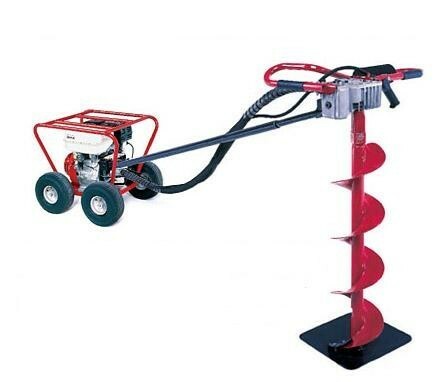 This Little Beaver post hole digger revolves at a medium speed for hard earth. Use your drill for fencing, deck work, landscaping, sign erection, soil sampling, and horizontal boring. Auger not included. Our 13:1 medium-speed Little Beaver post hole digger will get you drilling rocky ground and clay in no time! This mechanical earth drill revolves at 270 RPM. This medium speed increases your drilling productivity and results in cleaner holes. Reaches areas inaccessible to skid-steer loaders. Included roll cage prevents costly turf restoration by allowing your digger to glide across manicured lawns. Post hole digger features a Honda GX-160 OHV engine with 8-inch semi-pneumatic tires, roll cage and 13:1 transmission. Auger not included. 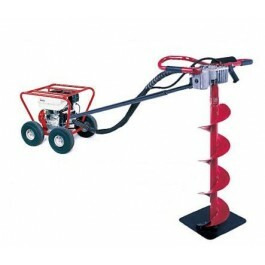 Use your post hole digger for fencing, deck work, landscaping, sign erection, soil sampling, and horizontal boring.